(2009). Electrochemical Corrosion of Oxidized Gamma Titanium Aluminide in Ringer's Solution. Iranian Journal of Pharmaceutical Sciences, 5(1), 51-54.
. "Electrochemical Corrosion of Oxidized Gamma Titanium Aluminide in Ringer's Solution". 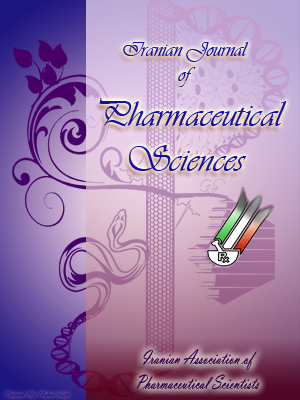 Iranian Journal of Pharmaceutical Sciences, 5, 1, 2009, 51-54. (2009). 'Electrochemical Corrosion of Oxidized Gamma Titanium Aluminide in Ringer's Solution', Iranian Journal of Pharmaceutical Sciences, 5(1), pp. 51-54. Electrochemical Corrosion of Oxidized Gamma Titanium Aluminide in Ringer's Solution. Iranian Journal of Pharmaceutical Sciences, 2009; 5(1): 51-54. Y-TiAl intermetallic alloy have a good potential for use as biomaterial, due to its good corrosion resistance. In this paper, two fundamental electrochemical techniques namely electrochemical impedance spectroscopy and potentiodynamic anodic polarization were used to evaluate the corrosion performance of g-TiAl in Ringer's solution. Surface modification treatments were employed with the purpose of improving corrosion resistance. The samples were oxidized at 550 °C in air for 1 h. The results show that oxidized Ti-47Al-2Cr has much better corrosion resistant in Ringer’s solution. The presence of the oxide layer formed with the surface treatments increased their corrosion resistance. The low values of corrosion rate, and the high values for corrosion potential (E corr) and polarization resistance (Rp) obtained experimentally implies that g-TiAl can be competitively considered as an alternative metallic biomaterial. g-TiAl alloys are excellent candidate materials for application in aircraft engines due to their improved high temperature properties over conventional titanium alloys [1, 2]. In recent years, good corrosion resistance of them introduced g-TiAl alloys as biomaterial . Ti-6Al-4V, on the other hand, has been used extensively for many years as an implant material, mainly in orthopedic applications. Many studies have been published recently on the corrosion of this titanium alloy [4-7]. Passivity as a result of film formation without breakdown was observed on Ti-6Al-4V surfaces over the potential range of -400 to +1400 mV vs. a standard calomel electrode (SCE) in Ringer's solution by Solar et al. . For implant applications it is necessary to assess both biological and corrosion aspects. Other Ti-based alloys are also being investigated for implant applications. In this research, the corrosion behaviors of Ti-47Al-2Cr and oxidized g-TiAl at 550 °C in Ringer's solution, simulated human body fluids, are investigated. For this purpose two electrochemical methods were employed: potentiodynamic polarization and electro-chemical impedance spectroscopy (EIS). Standard corrosion parameters such as corrosion current density (i corr), corrosion potential (Ecorr), polarization resistance (Rp) and corrosion rate (CR) were calculated from these experiments. Table 1. Composition of Ringer's solution. The High purity elements were accurately weighed and melted on water cooled copper mold, in a vacuum arc remelting furnace using a non-consumable Tungsten electrode to prepare samples of Ti-47Al-2Cr (%) alloy. The alloy was kept molten for 2 min., allowed to cool, turned and melted again. This process was repeated at least five times in order to ensure homogeneity. To obtain homogenized sample, a heat treatment in 1125°C for 72 h carried out in vacuum atmosphere. Then samples cut into 5×5×10 mm and oxidized at 550°C at air for 1 h. The control sample didn't have any oxidation. Next, the specimens were polished using emery sheets with grit ranging from 600 to 1200. The specimens were then degreased with methanol and distilled water, in order to obtain a clean surface. The potentiodynamic polarization curve of oxidized and control g-TiAl were measured using a conventional standard three-electrode electrochemical test system, in which the pure platinum grid was used as a counter electrode and saturated calomel electrode (SCE) as a reference electrode. A circle with 5 mm diameter (0.196 cm2 area) was exposed to electrolyte. All of electrochemical testes were carried out in Ringer's solution with the composition presented in Table 1 on an EG&G potentiostat, Model 273A. The potential scan rate was controlled at 60 mV min-1. During the tests, the electrolytes were in natural oxygen containing state and in ambient temperature. All the tests were repeated three times. Figure 1. Microstructure of Ti-47Al-2Cr after homogenizing. Electrochemical impedance spectroscopic (EIS) measurements were carry out with a 1025 Frequency Response Analyzer and were performed with frequencies ranging from 105 to 10-2 Hz, by impressing the specimen at a particular potential apart from open circuit potential for 1 h. The amplitude of the superimposed AC signal was 10 mV. The data obtained in terms of Nyquist and Bode plots was interpreted and fitted using Z-view software. The initial microstructure of g-TiAl alloys after homogenizing shows in Figure 1. It is clearly that g-TiAl mainly consist of 70 vol.% lamella with ~300 mm colony size and 30 vol.% blocky gamma and alpha-2 grains. The potentiodynamic polarization curve of oxidized and without any oxidation of g-TiAl in Ringer's solutions presented in Figure 2. It could be seen clearly that both oxidized and control samples had feature of passivation in a wide potential range in the electrolyte. Both were pitting attacked at chemical breakdown potentials, where the current density increased sharply. The breakdown potentials of control in Ringer's solutions were close to the values reported in the literature . As be presented breakdown potential of oxidized is much more than the control. Also the passivity region is shifted to less current values. Standard techniques were used to extract Ecorr, icorr and CR values from the polarization plots, samples of which are shown in Figure 2. Table 2 shows the polarization data obtained for b-TiAl including Tafel slopes (ba and bc), Ecorr and icorr values. From this table it is possible to observe low values of corrosion rate for both samples, although the oxidized samples of g-TiAl demonstrate much better passivation over a larger range of potential compared to control which loses its passivity at about 0.7 V. However, the formation of oxide on the b-TiAl samples, resulting from surface treatment renders these alloys passive and highly corrosion resistant in Ringer's solution and hence the loss of passivity mentioned above is no longer an issue. Figure 2. Potentiodynamic polarization curves for the γ-TiAl alloy in with and without thermal treatment at 550°C for 1 h.
Figure 3 shows representative electro-chemical impedance diagrams obtained for β-TiAl in Ringer's solution, for after thermal treatment at 550°C for 1 h and control samples. Experimental data are fitted using the equivalent circuits shown in Figure 3. The impedance data obtained for nontreated g-TiAl are simulated by a simple RCPE couple (Figure 4a), in which RW is the electrolytic resistance, CPEDL corresponds to the double-layer capacity and R p is the charge transference resistance of the passive layer. In the Nyquist diagram (Figure 3), impedance modulus of oxidized sample at the lowest frequencies of about 105 W at the lowest frequencies is observed. The high Roxide values, about 10 6 W (see Table 3), indicate the formation of a protective passive layer that confers a high corrosion resistance to the g-TiAl alloy. Table 2. Corrosion parameters from potentiodynamic polarization tests for g-TiAl extracted from Figure 1.
ba=Anodic Tafel slope,bc=Cathodic Tafel slope, CR=Corrosion rate. Table 3. Main parameters obtained from experimental impedance data using the equivalent circuits of Figure 3. The kinetic parameters (Ecorr, icorr) obtained by the potentiodynamic polarization technique for oxidized at 550°C for 1 h and without oxidation indicate good corrosion resistance for g-TiAl. The thermal oxidation treatments do impair the good in vitro corrosion behavior and are detrimental for the biocompatibility of the material. Figure 3. Nyquist plots for obtained for γ-TiAl alloy for after thermal treatment at 550°C for 1 h and control samples. Figure 4. Equivalent electrochemical circuits used to simulate the experimental data. (a): Control samples; (b): After thermal treatment at 550°C for 1 h.
 Kim YW. Microstructural evolution and mechanical properties of a forged gamma titanium aluminide alloy. Acta Metall 1992; 40: 1121-34. Kim YW, Dimiduk DM. Progress in the understanding of gamma titanium aluminides. JOM 1991; 43: 40-7. Delgado-Alvarado C, Sundaram PA. Corrosion evaluation of Ti-48Al-2Cr-2Nb (at.%) in Ringer's solution. Acta Biomaterialia 2006; 2: 701-8. Solar RI, Pollack SR, Korostoff E. In vitro corrosion testing of titanium surgical implant alloy: An approach to understand titanium release from implants. J Biomed Mater Res 1979; 13: 213-7. Mimura H, Miyagawa Y. Electrochemical corrosion behavior of titanium casting. Part I. Effects of degree of surface polishing and kind of solution. Jpn J Dent Mater 1996; 15: 282-95. Semlitsch MF, Weber H, Streicher RM. Joint replacement components made of hot-forged and surface treated Ti-6Al-7Nb alloy. Biomaterials 1992; 13: 781-8. Lopez MF, Gutierrez A, Jiménez JA. In vitro corrosion behavior of titanium alloys without vanadium. Electrochim Acta 2002; 47: 1359-64.